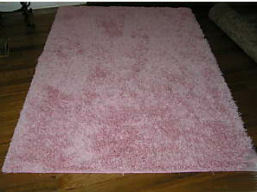 The most likely location for pink rugs is in the baby’s nursery or girls’ bedrooms. There are those times when I see the need for a touch of pink in a cottage’s sitting room, garden or even the den. But, by and large I find myself shopping for soft, pink shag rugs to pad the floors and brighten the decor in rooms decorated for girls of various ages. Regardless of what is considered stylish, your pink rugs have to blend with the bedding set as well as the decor of the room. Some shades of pink are easier to work with than others in terms of color matching as well as issues pertaining to maintenance. Hot pink rugs with patterns are better at covering the inevitable stains but powdery, pastel pink rugs are much more versatile, decoratively speaking. 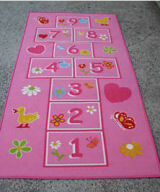 Pink and brown nursery rugs, pink and black nursery rugs or even mod pink and orange rugs are not out of the question. Rectangle rugs are popular to put by the side of the bed or crib and in small rooms, this may be all that’s needed. But if you have the floor space, round, pink rugs positioned in the center of the room is a very attractive way to soften the corners of a space and unify the furnishings. Pink animal print, pink shag rugs and pink camouflage print nursery rugs have been very popular with teenage girls as well as for use in baby's room. Tweens and pre-teens are still into Barbie, unicorns and hot pink heart rugs. 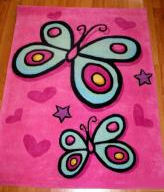 Other favorites are pink rugs with butterflies, ladybugs and other traditional favorites with the nursery set. 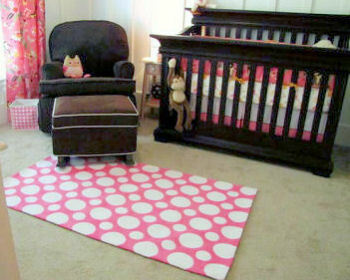 See more pink and brown baby girl nursery rug pictures here. Most pink baby nursery bedding sets include a matching rug as part of the collection along with other coordinating decorations. There are times when there is no choice but to use what is offered because of difficulties matching colors or a particular theme and this is an acceptable practice. However, I prefer to shop for a rug that brings a complementary but different decorative element to the room. The reason for this is that it keeps your baby girl’s nursery or your toddler girl’s bedroom from looking like a display in a department store. And when it comes to your kids’ rooms, unique is always better. The fluffier the better is my taste in area rugs but in kids’ bedrooms this is not always practical. Lucky for us, manufacturers have made great strides in making indoor outdoor rugs very attractive. 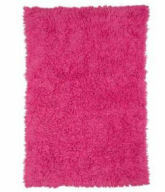 So attractive, in fact that I have used these easy to clean pink rugs in many decorating projects. But there are those times when nothing but pink, shaggy rugs will do. The bottom line is that the key to choosing pink rugs for your project is to get a good color match or contrast, choose the proper shape and size and when decorating a high traffic area or a kid’s room, search for a washable rug or one that is easily spot-cleaned. Return to Unique Baby Gear Ideas to find more information on the best rugs for your baby girl's nursery.